You are here: Home / Natural Fine Planetary Talismans / Unheated and Rare Natural Sri Lankan Yellow Sapphire of 2.87 carats set in 22KDM Hallmarked Gold, Made available to GemstoneUniverse.com Patron on 14th Feb 2010. Unheated and Rare Natural Sri Lankan Yellow Sapphire of 2.87 carats set in 22KDM Hallmarked Gold, Made available to GemstoneUniverse.com Patron on 14th Feb 2010. Unheated and Rare Natural Sri Lankan Yellow Sapphire of 2.87 carats set in 22KDM Hallmarked Gold. Collection number 2897 . Certified Yellow Sapphire with no heat or enhancement. Final Price INR USD($)1560 all inclusive. Made available to Gemstone Universe.com Patron on 14th Feb 2010. This flawless butter Yellow Sapphire pendant made an ideal Valentines Day gift. So rare and precious. Just enjoy the color and radiance of this fine Yellow Sapphire. This color is very rare to find. 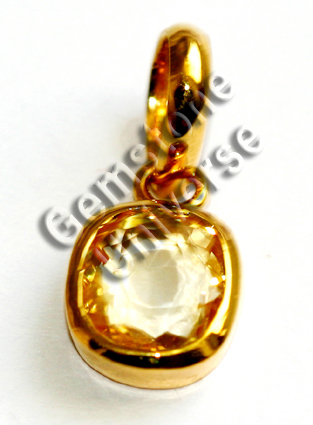 It represents one of the best gemstones from the gemstoneuniverse.com collection of fine, natural, certified gemstones. Hi This one looks mindblowing. Are u going to get new lots soon. Mail me.